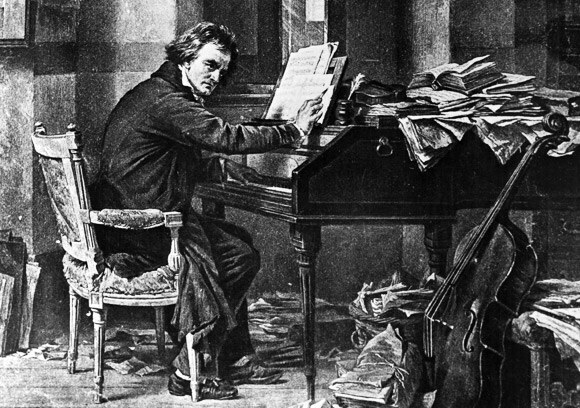 So much has been written about Beethoven, and most people know of his story. When I first learned of the Heiligenstadt Testament, it became a kind of inspirational compass for me. When I’m having a bad time of it, I just have to read this document and, doing my best to preserve my mascara, my perspective bounces back immediately. This extraordinary document was written in October 1802 in Heiligenstadt, a Vienna suburb where Beethoven lived for a few months on doctor’s orders. It was addressed to his brothers Karl and Johann. He references contemplations of suicide but decides he must live for his art. He first experienced hearing problems at age 26, and had lost 60% of his hearing at the time he wrote this, at age 32. He was completely deaf by 46. Think that for six years now I have been hopelessly afflicted, made worse by senseless physicians, from year to year deceived with hopes of improvement, finally compelled to face the prospect of a lasting malady. Though born with a fiery, active temperament, even susceptible to the diversions of society, I was soon compelled to withdraw myself, to live life alone. If at times I tried to forget all this, oh how harshly was I flung back by the doubly sad experience of my bad hearing. My misfortune is doubly painful to me because I am bound to be misunderstood; for me there can be no relaxation with my fellow men, no refined conversations, no mutual exchange of ideas. I must live almost alone, like one who has been banished; I can mix with society only as much as true necessity demands. If I approach people a hot terror seizes upon me, and I fear being exposed to the danger that my condition might be noticed. But what a humiliation for me when someone standing next to me heard a flute in the distance and I heard nothing, or someone heard a shepherd singing and again I heard nothing. Such incidents drove me almost to despair; a little more of that and I would have ended my life — it was only my art that held me back. Ah, it seemed to me impossible to leave the world until I had brought forth all that I felt was within me. Forced to become a philosopher, oh it is not easy, and for the artist much more difficult than for anyone else. Recommend virtue to your children; it alone, not money, can make them happy. I speak from experience; this was what upheld me in time of misery. Thanks to it and to my art, I did not end my life by suicide. Farewell and love each other. Destination Classics, on today at noon with host Mike Duncan, will feature Beethoven’s music. Evgeny Kissin is one of the most incredible pianists on the touring circuit. He plays Beethoven’s notoriously difficult Piano Sonata No. 32 in C minor, Op. 111. This is Beethoven’s last piano sonata and is emotionally charged compared to his early works, which is why he was eventually dubbed “the first Romantic”. He was completely deaf by the time he composed this. Beethoven was born (likely December 16, but christened) December 17, 1770 in Bonn, Germany, and died March 26, 1827 in Vienna, Austria.